POETS & WRITERS Magazine names Martha Alderson‘s The Plot Whisperer as one of the Best Books for Writers. The author provides insight on how to create works of fiction with powerful stories and focuses on how to devise a Universal Plot, plot lines and subplots, compelling scenes, and character transformation. Click here for a list of Coach Teresa’s event. The Plot Whisperer aka The Plot Guru aka The Martha Alderson! The Plot Whisperer Book of Writing Prompts: Easy Exercises to Get You Writing is here! If you’re NOT in Northern California Tuesday, January 22nd, 2013 to celebrate the official release of latest book in The Plot Whisperer series with Martha, you can still have an autographed copy. See below. You’re invited. Bookshop Santa Cruz, Santa Cruz, CA 7:00pm. Come for the cake. Stay for the plot tips. Start the new year out right. Give yourself and your writing the gift of an intense look at the plot and structure and communication your story conveys. Devote a disciplined 5 hours exclusively to the character emotional development plot, dramatic action plot and the thematic significance plot and take your story to the next level of excellence. The latest Plot Whisperer book beckons me from teaching writers how to plan and test a story with a plot to the actual writing a story with a plot from the beginning to the end. Use The Plot Whisperer Book of Writing Prompts: Easy Exercises to Get You Writing and write a novel, memoir, screenplay with me one prompt at a time. Join me. Plot support on my blog. 3 books – the set! the kit! Coach Teresa here . . . My mother-daughter novel Love Made of Heart would not have hooked super agent Stacey Glick in 2000 if Martha Alderson had not taught me how to plot and understand the functions of front story and back story. Thank you, Plot Whisperer Martha! I advise every writer to consult with Martha Alderson at least one time after you have written your first draft. Her books = survival kit for writers. Cheers to The Plot Whisperer aka The Plot Guru aka The Martha Alderson! As author of Love Made of Heart, creator of Love Made of Heart gift items and the Talking to My Dead Mom Monologues, Teresa encourages writers to speak out (in print) for those who cannot speak for themselves. May your major and not-so-minor characters be memorable! In The Apartment (script by Billy Wilder and I.A.L. Diamond ), the 2 protagonists are C.C. Baxter, an insurance clerk (whose apartment is much in demand by four executives for their extramarital activities) and Miss Kubelik, an elevator operator in the insurance company (who is described by Baxter as a “perfectly respectable girl”). Then there’s Miss Olsen. She is secretary to Jeff Sheldrake who is head of Personnel. Miss Olsen appears in only a few scenes, yet, she personifies multiple archetypes—shape-shifter; herald, but also threshold guardian; antagonist, but also ally. Her character fascinates me. Baxter’s and Kubelik’s heroes’ journeys would not have begun if not for the action of this not-so-minor character. I recommend your studying The Writer’s Journey: Mythic Structure for Writers by Christopher Vogler and The Plot Whisperer: Secrets of Story Structure Any Writer Can Master by Martha Alderson. Coach Teresa edits manuscripts (contemporary novels; thrillers; children’s novels; memoirs) for authors who want to attract agents & publishers OR want to be their own publishers. Coach Teresa, what’s new with your mastermind group members? Linda Lee is busy writing her book, being co-president of Women’s National Book Association-San Francisco Chapter, getting ready for San Francisco Writers Conference, creating beautiful websites for her clients that reflect their businesses. Mary E. Knippel is busy helping her clients create their vision boards / collage / success stories and perfect content for their websites, facilitating events at Women’s National Book Association-San Francisco Chapter and getting ready for San Francisco Writers Conference . Lori Noack is busy with her new company Vintage San Francisco (women’s clothing and accessories 1950-1980) and managing the Italian Garden Flat. Luisa Adams, author of Woven of Water, is busy with Spanish class, her book group, being celebrity author at her grandchildren’s school and everywhere she goes, and inspiring your truly and many other fans. 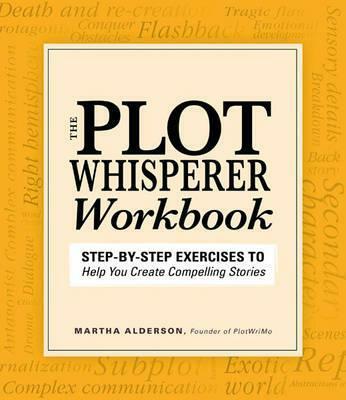 Martha Alderson is busy consulting her clients and promoting her wonderful new book The Plot Whisperer: Secrets of Story Structure Any Writer Can Master. Rebecca Martin and her staff at Dear Jane Inc. help people find jobs! Cheers to global workforce! Sign up for her helpful newsletter. Watch Rebecca’s videos on her website. Ask editor / manuscript consultant Teresa to help you identify themes and archetypes in your manuscript, book proposal, query letter. Ask Coach Teresa to show you shortcuts on your PC; how to crop photos and add captions; create signature block in email setting, a blog, facebook page, YouTube channel, online press room, and more. Coach Teresa LeYung-Ryan has helped over 1,000 writers take steps to further their careers. http://www.WritingCoachTeresa.com Please click on [Coach Teresa’s Blog] for more resources. Contact her @gmail.com (her email ID is: WritingCoachTeresa ). Happy Writing and Platform Building! Manuscript Consultant/Coach Teresa LeYung-Ryan here, visiting dear pal Karyn in Australia . . . I wish to remind all writers to please reward your work with authentic details. Your story deserves thorough research (yes, even for memoirs). Example: The first time I stepped off the sidewalk to cross a street in Sydney, I was “reminded” by a moving-vehicle where I was (my setting). You see . . . folks here in Australia drive on the left side of the road (What does that mean for pedestrians? What does that mean for other drivers?). What else about “left” ? Walk on the left side when possible; on escalators, stand to the left and pass to the right. Utensils: fork in the left hand and knife in the right while eating. What’s the big deal? It’s a big deal if you have your protagonist as a stranger in Australia or if you set your story in the U.S.A. but your character is Australian (then the U.S.A. would be foreign territory for her/him). I encourage everyone to conduct research and get proofreaders for your manuscript (yes, even for memoirs). Authentic details hook readers. Luisa’s memoir Woven of Water is a beautiful example of employing authentic details and plotting nonfiction. Coach Teresa, what happened when you hosted blog tour for Plot Whisperer Martha Alderson? Coach Teresa, what happened when you hosted Plot Whisperer Martha Alderson on your blog? Martha Alderson is one of the seven members of our mastermind group; my previous post included two other members–Job Seeker’s Writing Mentor Mary E. Knippel and Employment Counselor Rebecca Martin. Hosting an author who is on blog tour (even when the author is beloved Martha Alderson) requires a series of publicity outreach, special invitations, and, of course being present on the day of author-arrival to my blog. 22 writers showed up for Plot Whisperer Martha Alderson! Please read their wonderful questions about story plotlines and the Plot Whisperer’s helpful answers to authors of novels, memoirs, creative nonfiction. Each writer who participated was eligible for the drawing. The winner would get a copy of The Plot Whisperer: Secrets of Story Structure Any Writer Can Master. I had each participant’s name on a piece of paper, and all the entries went into a red bag. After a few shakes . . . one entry was pulled out. The winner is Janet Kerr in Canada! Congratulations, Janet! Thank you, Everyone, for making my blog a fun place for The Plot Whisperer. Coach Teresa here to say that Martha’s new book The Plot Whisperer: Secrets of Story Structure Any Writer Can Master has motivated me to the point that I’m writing my second novel on public transit. Last night I even missed my stop because I was engrossed reading Martha’s “Some Final Thoughts” in her book. I am on fire writing and dreaming my next novel. Thank you, Plot Whisperer Martha Alderson! You’ve heard of authors going on book tours? These days, authors go on blog tours too! Tonight Martha will be at Capitola Book Café, but, DURING THE DAY October 18, 2011, she’ll be touring here at my blog!!! So, say hello to Martha, ask her a question about your plotline if you like… by submitting a comment to this post. How to do this? Follow instructions below photo of Martha. Be sure to key in your URL to broadcast yourselves. I will conduct a drawing by the end of the week and one of you hardworking writers will win Martha’s new book. Writers, You go ahead and . . . If Martha can’t get to all the submissions on this blog today, I’ll keep track of your submissions and notify Martha so that she can respond within this week. On October 22, 2011 I will put your names in a drawing to win a copy of Martha’s new book! The winner will get an email from me (at which time you can give me your shipping address). I am so excited about Martha’s new book; I am a better manuscript consultant for having studied it. And, Martha’s examples of Energetic Markers have given me the sparks to re-plot and rewrite my second novel. If not for Martha’s teachings, my first novel Love Made of Heart wouldn’t be where she is today–in libraries; archived at the San Francisco History Center; chosen by teachers in colleges and universities as required reading; attracting a steady flow of readers/fans; being my passport to speak out for those who cannot speak for themselves. Because I write about sobering issues (mental illness, stigmas, second-hand violence, physical abuse), my weaving the thematic threads and using the energetic markers to knot the threads result in delivery of a compelling story. Plot Whisperer Martha, I humbly thank you! In every story—be it a novel, memoir, biography, screenplay, essay, or picture book. This empowering book helps you acquire secrets of story-structure and gain personal energy in order to survive and thrive the writing journey. The Plot Whisperer gives you hope–after all, aren’t you the protagonist too? May the Energetic Markers be with you! Guess what? Also, I use Martha’s plot methods for my prescriptive nonfiction (how-to books). Build and sustain page-turning-energy for any genre. Also visit The Plot Whisperer’s blog – what treasures! Remember to click on the blue header (title bar) of this post to introduce yourselves to The Plot Whisperer. You can get Martha’s book for yourself and your dear writing buddies by asking your favorite bookseller, going to her publisher Adams Media, or from Amazon. And, when you write reviews on Amazon and other sites, you’re helping yourself build your platform and fanbase. Coach Teresa here, working side by side with pal & colleague Mary E. Knippel today. Elisa Southard and I meet once a month to work together. Today is with Mary. use facebook to broadcast Writing Mentor Mary‘s appearance tomorrow. critique Mary‘s material for her presentation tomorrow. blog about October events for writers and anyone who needs to express themselves through writing. blog about getting more mileage after you’ve posted a comment on someone’s blog. blog about Love Made of Heart turning 9 years old this month October! Love Made of Heart inspiring adult children of mentally ill parents to speak openly about the stigmas and find resources for their families. As a manuscript consultant, Teresa LeYung-Ryan loves helping writers identify their themes and archetypes. Coach Teresa here. On Monday I was a protagonist who wanted to be with dear friends Luisa Adams and Martha Alderson to celebrate Martha’s new book–The Plot Whisperer: Secrets of Story Structure Any Writer Can Master. I wanted to be with my pals! While I was in San Francisco, living out my Plot B, I filmed the TransBay Terminal and shared advice about using everyday setbacks to plot drama & tension for your protagonist. Her / His character growth is revealed when you show how she / he reacts and what steps she /he takes to get what she / he wants. Teresa on facebook! She’s also involved in Women’s National Book Association and California Writers Club.